﻿ News Bharati - Nagpur Oranges.. You go global..!! News Bharati - Nagpur Oranges.. You go global..!! Nagpur, January 28: “Unless the intermediaries are extant between the farmers and direct market, the farmers won’t be able to earn the set profits. In order to grant direct access to market, the state will provide the farmers with necessary technology and aid. 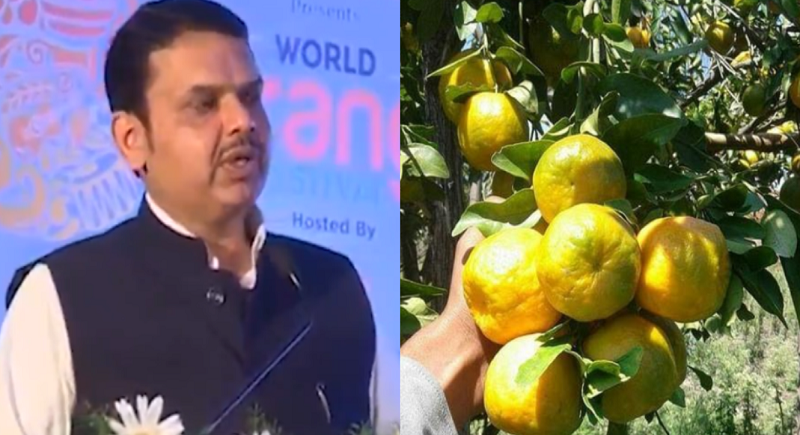 This will help in raising the orange export making it a global concern”, said Maharashtra CM Devendra Fadnavis at the World Orange Festival at Nagpur on Monday. “Further with a view to promote agri-business in 10000 places in the state, the government in collaboration with the World Bank, has taken up a programme to educate and train the farmers and the aligned persons for agri-business. We are making the required infrastructure for this which costs totalling Rs 3000 crores”, he added. Focussing over the new project lauched on 15th of January this year, Fadnavis said that the state has also undertaken the project named Maharashtra Agri-tech which is efficient to manage the product lifecycle digitally. “Under this project the area under cultivation from sowing to harvesting, climate and diseases on crops will be monitored digitally using satellite and drone technology”, he added. According to the state CM, around 1.5 crore farmers will be brought on the digital platform under this program, supported by Maharashtra Remote Application Centre (MRSAC) and ISRO. In its first stage, crop management, area under cultivation will be brought on digital platform in six districts in the rabi season. Satellite monitoring from sowing till harvesting of area under cultivation will be used to predict exact produce. It will be used to counter diseases on the crops, including the climate change. Appreciating the efforts taken by the Prime Minister in this matter, CM fadnavis said that Modiji has taken various steps to set market for the fruits grown in our nation. “He approached the companies making aerated drinks and stated them to use 10 per cent pulp in the drink. This has ultimately created a huge market for the farmers, especially in the state of Maharashtra as the result of maximum contribution. With this we will have to focus on the quality production of the raw material”, he asserted. Meanwhile, the Orange Growers Association has made a statement referring to which the state is planning to schedule a meeting separately. The prime demands of the association include a demand for pack house. Karanja and Morshi in the state had pack houses which were ceased due to some reason. It is with the association’s initiative that both the pack houses are reopened. “Packing and Coating began due to which the orange export raised and is underway raising. Sri Lanka, Dubai, Qatar, Bahrain have started receiving the special Maharashtra oranges. We are also on the verge of establishing the orange estates which will support the logistics and the related procedures, making these oranges global”, CM Fadnavis said in relation. The second World Orange Festival in Nagpur is offering its famed oranges to the world, will also showcase and brand the exquisite fruit in order to boost its export. Agricultural experts and scientists from various countries participated in the workshops and guide farmers. It’s a global platform that puts quality, trade, culture and celebrations around Nagpur oranges in the spotlight. Creating excitement around oranges and celebrate the culture of Nagpur among people on national.